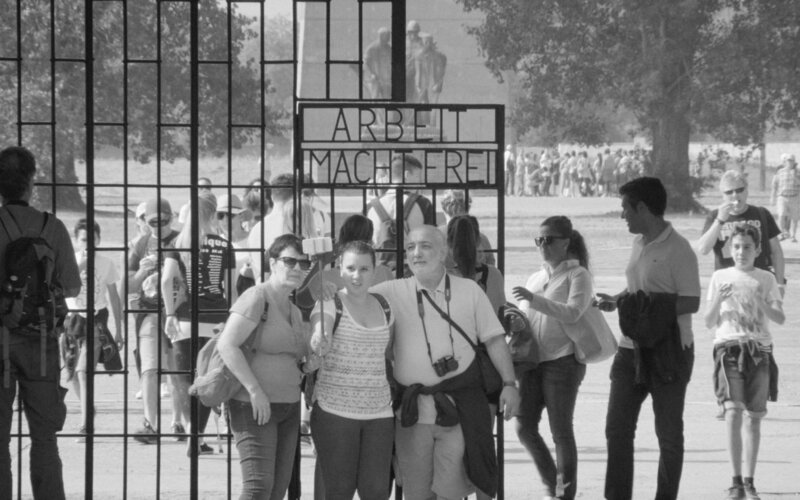 Observational documentary observes tourists as they walk around and through Auschwitz. The film is a series of static black and white shots as tourists walk up to to and then through the gates of the concentration camp. We watch as they wander the grounds and buildings and then leave. For some this is going to be a deeply moving film. For some this is going to be some sort of profound experience making them ponder how the the death camp has kind of become a somber amusement park as visitors wander around kind of blankly. For others this is going to be a long haul as we simply watch people wander by and tour guides try to explain in various languages what happened. I don't really have an opinion on the film. To be honest I understand what the film is trying to do and force a confrontation with how a place where millions died is now a place many people really don't understand- but at the same time I don't know if it succeeds. In away there was a point where I started mumbling to myself, "I get it, now what?" I don't know about the now what part. If you like observational docs, by all means give this film a shot. All others can take a pass.